As it is said at Wikipedia Father’s Day is a celebration honoring fathers and celebrating fatherhood, paternal bonds, and the influence of fathers in society. Many countries celebrate it on the third Sunday of June, but it is also celebrated widely on other days. Father’s Day was created to complement Mother’s Day, a celebration that honors mothers and motherhood. A complementary integration lives from the fact that both sides, both poles belong to each other. It also means that both sides influence the other in a way that complementation always gets back into a good balance. 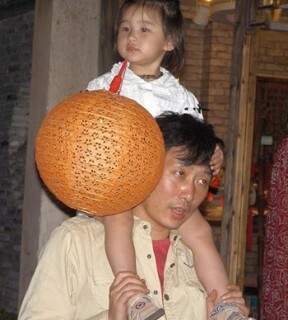 I was told that father`s day in China is not at all ……………..celebrated in a way that the above idea is realized. The mother-father-relationship in terms of officially celebrated does no longer exist as it was supposed to be. What had happened? Why is this disbalance to be found? Who knows about the reasons? I think that this also is due to the overestimation of the mother`s side. And I am also convinced of the fact that it would important for man and society and culture to find out why men, that means today fathers are so underestimated. Why the social and cultural value of fathers is so low? I was also told one aspect which helps to explain the meaning of father`s day in China, which originally was celebrated in August and not today, in June. This is determined by the fact that the Eighth(ba) day of the Eighth(ba) month makes two “eight”s (八八, ba-ba), which sounds similar to the colloquial word for “daddy” (ba-ba，爸爸). If it like this, the value of fathers just derives from a good sound of two figures namely: “eight”. Well, I am convinced, and I am a father, that fathers are more important than just to stand for a good sound of the figure: “eight”.